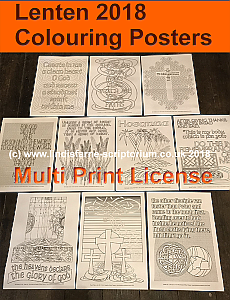 This year we have produced 10 colouring posters covering Ash Wednesday, The First to Fifth Sunday in Lent, Palm Sunday, Maundy Thursday, Good Friday and Easter Day. The Bible passages are taken from the Church of England Lectionary 2018-B but cover common readings used throughout Lent. Whether you’re looking for a youth program, a communal art activity or something a little different to do for Lent this year, our Lenten Colouring Posters provide a creative, engaging and participatory way for ALL AGES to engage with their faith. We are providing the posters in both printed format (29cm X 42cm (A3)) and as digital images (via Adobe PDF file) so if you want you can print them smaller or larger depending on your group size. You can also buy just the digital file for printing at home with a specific license for your own use. Our printed posters are printed on heavyweight, 200gsm paper. You can use crayons, coloured pencils and felt pens easily. You might also want to experiment with other mediums as well to see what works best for you and your group. The readings are: Ash Wednesday - Psalm 51.1-18. Create in Me. 1st Sunday in Lent - Psalm 25.1-9. Show Me. 2nd Sunday in Lent - Mark 8.31-38. Who wants to follow? 3rd Sunday in Lent - Psalm 19 - The Heavens Declare. 4th Sunday in Lent - John 3.14-21 - That the World might be Saved. 5th Sunday in Lent - John 12.20-33 - Unless. Palm Sunday / Liturgy of the Palms - John 12.12-16 - Hosanna. Maundy Thursday - 1 Corinthians 11.23-26 - In Remembrance. Good Friday - John 18.1:19.42 - Golgotha. Easter Day - John 20.1-8 - The Other Disciple. We ship the posters in heavy-weight cardboard poster tubes within the UK. For our international customers, you can purchase the digital version of the posters and get them printed locally. Sunday School / Youth Groups. 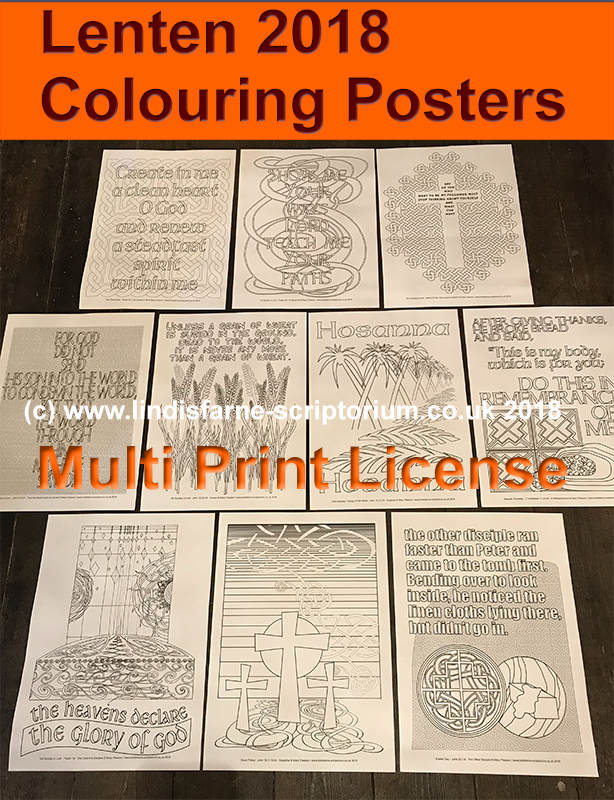 As part of your Youth program encourage your kids to colour in the posters and then display or present them in the Church either week by week or as part of the Easter Day service. Many churches have topical Bible Studies throughout the year, why not get a group together and do a study on the bible passages and colour while you learn! Have your children’s/youth ministry take a poster to a nursing home to colour with the residents. Or leave some with the residents and pick them up to share with your church. Your church could host a simple soup/salad/sandwiches meal each week during Lent and have conversation and colouring before or after eating together. Leave the colouring posters out on tables during Coffee Hour/Fellowship Hour after church for people of all ages to sit, colour, and talk with one another. Set up a couple of tables in your church space to allow young people (and the young at heart) to colour during worship. A great way for children to engage with worship in a new way. We have been told about our images being used in Prisons, in Colleges, in Mission, in Retreats. Why not try bringing them into your Church. Please note... This product is for a PDF by email/download containing print masters for printing the images up to A4 size. It comes with a license to produce as many copies of the colouring pages as you wish.